As I said in my "Got the shakes" thread in Chatterbox I've got a benign essential tremor. I've had it for years and it has been getting worse, despite the medications. My neurologist says we've gone about as far as medication is going to take us so this might be about as good as it gets. I have had to find ways to deal with it. I'm an electrical engineer and communicating with electrical contractors is a big part of my job. Where I used to hand sketch some thing out, it now gets done in AutoCAD. Hand written notes and instructions are now done in Word or by e-mail, which also has the added advantage of giving me a paper-trail. A couple of weeks ago I was making some wiring changes to my 3D printer that involved a minimal amount of soldering - couldn't do it anymore, my hands shook too much. For some reason not being able to do that simple activity really pissed me off and I decided that I wasn't gonna take it no more. I've got a 3D printer, I'm gonna build me some type of a jig/contraption that will allow me to successfully make a solder joint. I want to be able to make that joint whether it's on a PC board or just splicing a wire, so this thing is going to require a fair range of movement. I also want to be able to extend and retract the soldering iron to bring it into contact with what ever I'm trying to solder. One last requirement, this thing has to be fairly compact and easy to store. I'm also going to make this so that the parts are either 3D printed, bar stock and/or threaded rod that is just sawn to length, or simple plywood rectangles. My first thought was some type of a movable X-Y table with the soldering iron on one side of the table and the solder roll on the other side of the table with everything meeting somewhere in the middle. Then I realized that every time I needed to re-position the soldering iron I would also have to re-position the solder, etc., etc.... Not acceptable, too clumsy and time consuming. My current thought is to have the solder roll and soldering iron slaved together. Last weekend while I was waiting for the printer to get done with an 8 hour-ish print I started playing around with a 3D model of what I want, see the attached 3D PDF. The model is rather crude because I'm still learning this 3D stuff. I'm an electrical engineer, I don't NEED to know how to do 3D cad. 2D cad works just fine for electrical schematics - thank you very much. The silver/gray thing is the solder feed tube, and the brown cylinder is an 8oz. roll of solder. I haven't got the solder feed mechanism drawn yet, but it'll fit between the 2 red soldering iron clamps and it'll be in line with the solder feed tube. I'm thinking that the feed gear for a 3D printer Bowden style extruder drive would be a Jim-Dandy starting point for the solder feed drive. I also haven't got the soldering iron extend/retract mechanism thought through entirely. 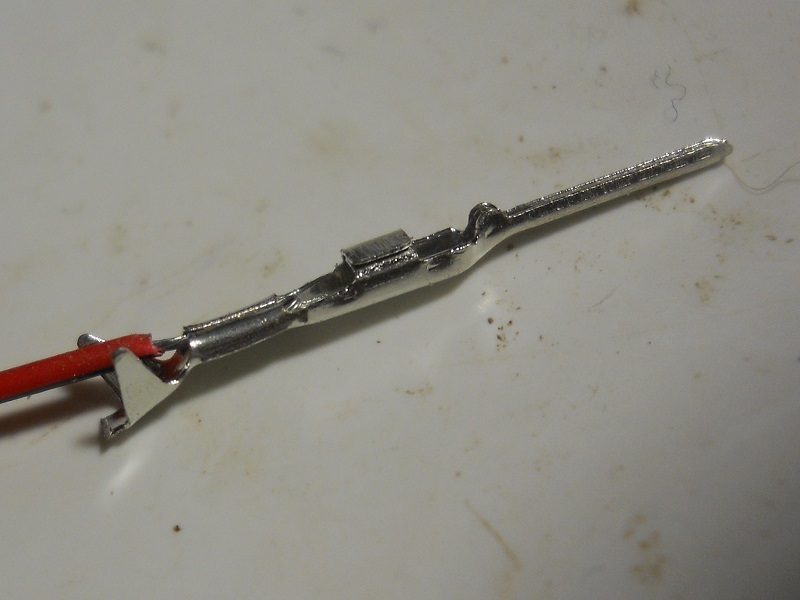 Right now it is shown as the red bar that holds the 2 soldering iron clamps apart. It could be as involved as a rack and pinion or a feed screw of some type, or it could be just a friction clamp that keeps the iron where I put it. The X-Y table at this point in time is just a lot of hand waving and head scratching. I thought I'd start at the soldering iron and work my way out from there. Don, I'm just seeing a blank white sheet in the .PDF. Is it just me or are others seeing the same. Also a blank for me. Acrobat Reader blocked 3-D content but still no joy after enabling it. When I first open the PDF from the thread I see a blank white sheet with a grey box in the upper left-hand corner. The grey box has a red question mark in it. Is that what you're seeing? If so then there should be a yellow bar across the top of the screen with an "Options" button/tab towards the right-hand side. It was about even with the edge of the white area on my PC. This will give you a pull down menu with the options of "Always trust this document" or "Trust this document once". Select one of them, because if you don't tell your PC security to "trust" the document it won't allow you to enable the content. After you've "trusted" the document then you can click on the grey box and enable the content. Not sure if you need to left click or right click, can't get into that screen while I'm typing this. After you've trusted the document and enabled the content you SHOULD see the model on the screen. That's what worked for me anyway when I opened the PDF from the thread. If that doesn't help then we need to go further into the realm of IT and cyber-security than I care to delve, or I am qualified to for that matter. I haven't figured out how to embed the PDF within the thread yet, that's why it's attached. I downloaded the file too. When downloading the PDF my system asks whether I want to open the file, or save it. I just tell it to open the file, I figure that I can always do a "Save As" from Adobe if it's something I really want to keep. That way I don't have extra files laying around taking up hard drive space. With todays drives this isn't a problem, just a habit left over from the "OLD" days when we thought that we'd NEVER fill up a 100MEG hard drive. Good thing I'm not as old as Zee, he had to carve his own bits to code with...! I don't know about carving the bits but the first harddisks I worked with where 5MB. The newer ones where 5.25" full height and the old ones where 14" remove able - the drive weighted 135Kg. ~ 297 pounds. The more annoying fact was the newer 5.25" drives crashed a few times every day and you just might have lost all in such a crash - we had tape backup for the same reason (it took 10 minutes to make a backup). This was back between 1979 and 1985 - the next gen 10MB drives where a lot better - like a month between crashes, and a few years further down the line we almost stopped making backups .... until we got servers. I haven't had a chance to work on this "fix" lately, I've been working on cleaning up the rat's nest of cables that has existed at the RAMPS board since I first got the printer, see attached photo. 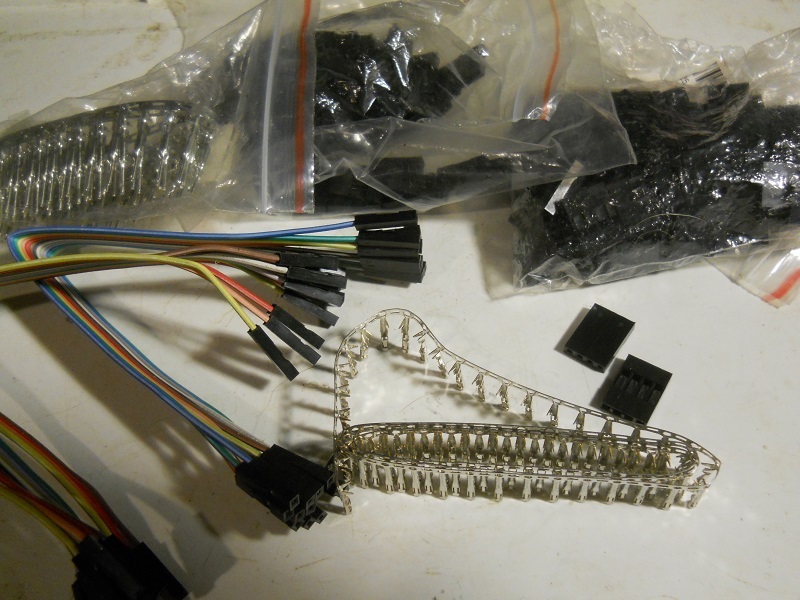 I have 2, 3 and 4 pin JST connections on my ramps board so I ordered a kit of bodies, connectors and male pin headers so that I could make up any connection I needed - I thought. 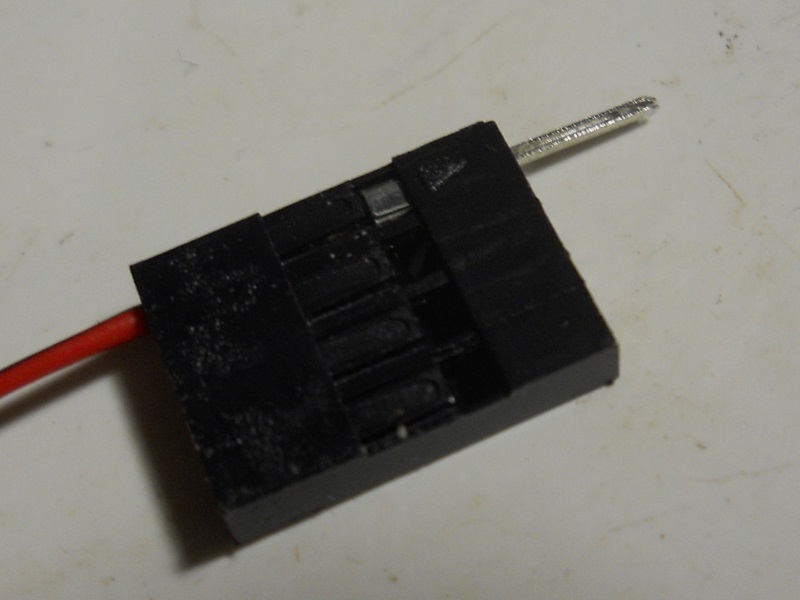 I also ordered a crimper, the Chinese generic equivalent of an SN-28B, that SAID it would crimp both JST connectors. 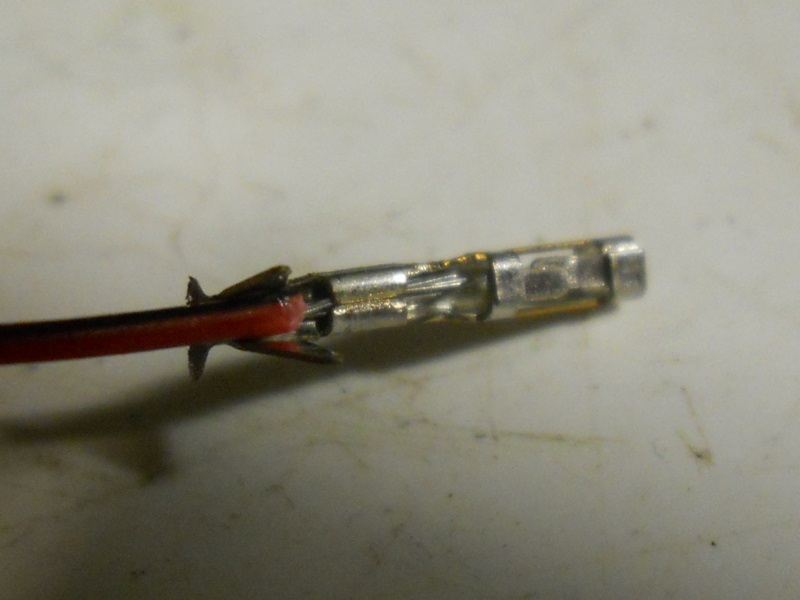 Don't you believe it, an SN-28B does a Jim-Dandee job of crimping Dupont connectors but it will cut a JST connector in half if you try using it to crimp a JST connection, DAMHIK. I ordered another crimper that was strictly for JST connectors, not knowing any better I ordered the crimper for the smaller pitches 0.5 - 1.0 - 1.5. I've got the itty-bitty connectors right? Ummmm... not so much, couldn't get the connectors to fit in the crimper without crushing something. It finally dawned on me that the pitch numbers are referring to the center to center spacing of the pins in mm. I've got a 0.1" center to center spacing on the pins or - wait for it - 2.54mm. I looked into getting different crimper dies for the crimper I already had. I could get die sets to crimp just about everything EXCEPT the ones I actually needed. Sooo... ordered ANOTHER crimper, this time for the 2.54 and 3.96 pitches. When JST connector set arrived it was for 6, 7, 8 and 9 pin connectors. This wasn't what I ordered - was it? Go back to the order, yup - it's EXACTLY what I ordered, CRAP, CRAP, CRAP, CRAP, CRAP. Back to EBAY - check. Find 2, 3, 4, and 5 pin JST connector kit, in 2.54mm pitch - check. Buy now - check. Wait... DAMN I hate waiting. 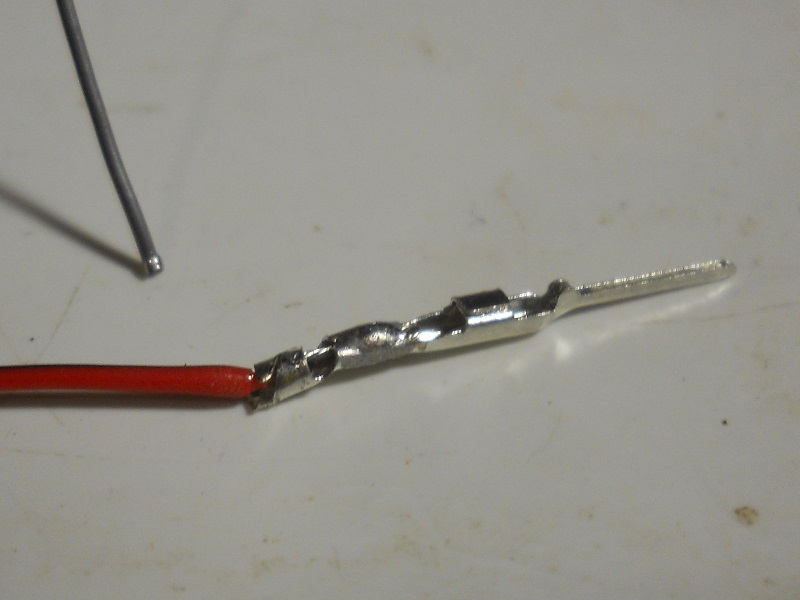 My 2.54 pitch crimper finally arrived last night and I can NOW properly crimp 2.54 JST connectors, most of the time. I still get a 10-20%, or more, reject rate - but I blame that on operator error, not the equipment. I got 4 out of 5 stepper motor cables shortened last night and one of the axis limit switches done before my neck got sore from being hunched over for hours. I only had one boo-boo and that was on the Z axis limit switch cable, didn't have it plugged in completely. Tonight I should be able to get take care of the rest of the cables and maybe even get the RAMPS board enclosure installed. However because of my little Z axis limit switch boo-boo, I now get to re-level the X axis. Oh the joys of owning/maintaining a 3D printer. Go back a bit further. Started with a 5 Meg drive. Then a 10! We were swimming in space...and then came Windows. And yes, I started with Hollerith cards. I couldn't believe my fortune when RAM chips doubled in size from 1K to 2K. I'm watching this thread because it's a classic case of 'got a problem - will solve problem' and it's a problem that touches, or will touch, many of us. I bought some male and female connector pins and housings that would probably work for the 100 mil (2.54mm) connectors. Pins were about $2/100, housings $1 to $5/100. 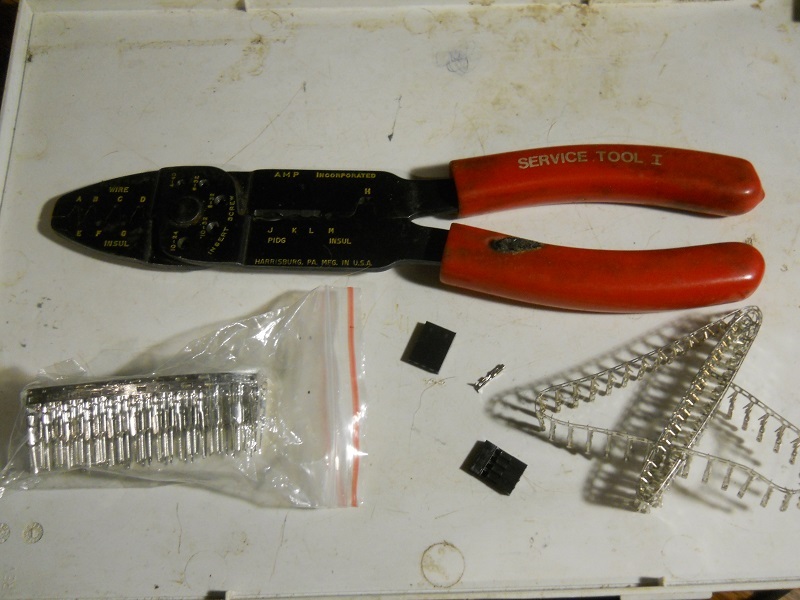 I use an AMP service tool crimper for these and other small crimp connectors. What you are showing are the Dupont type connectors. The pin and socket terminals for a Dupont connector will not work in a JST connector. In a Dupont connector the pins and socket terminals are held into the plastic body of the connector by a small plastic tab molded into the body. You can see the tabs in your last picture. The Dupont connector terminals are also longer that the JST terminals. 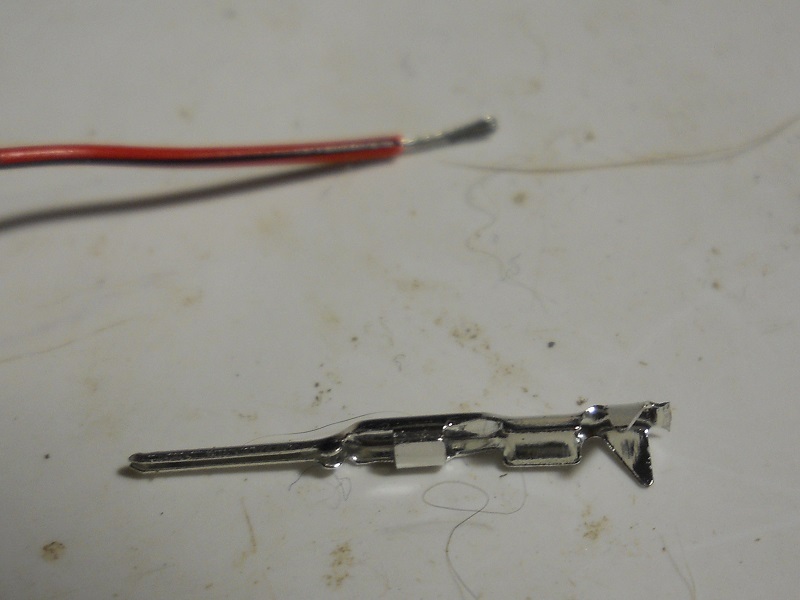 The pin and socket terminals for a JST connector are held into the plastic connector body by an itty-bitty metal tang that is part of the terminal. That tang was part of reason I was getting such a high reject rate at first. I don't know if my Chinese crimper dies are on the wide side of the Quality Control limits, or if my crimp terminals tang position is on the narrow side of the Quality Control limits, but for some reason my crimper was smashing that tang flat. With no tang, there is noting to hold the crimped terminal in the plastic connector body. My current work around is to bend the tang up about 30° to 45°. This gives me the fraction of a mm clearance that I need between the crimper die and the tang when crimping a termination. 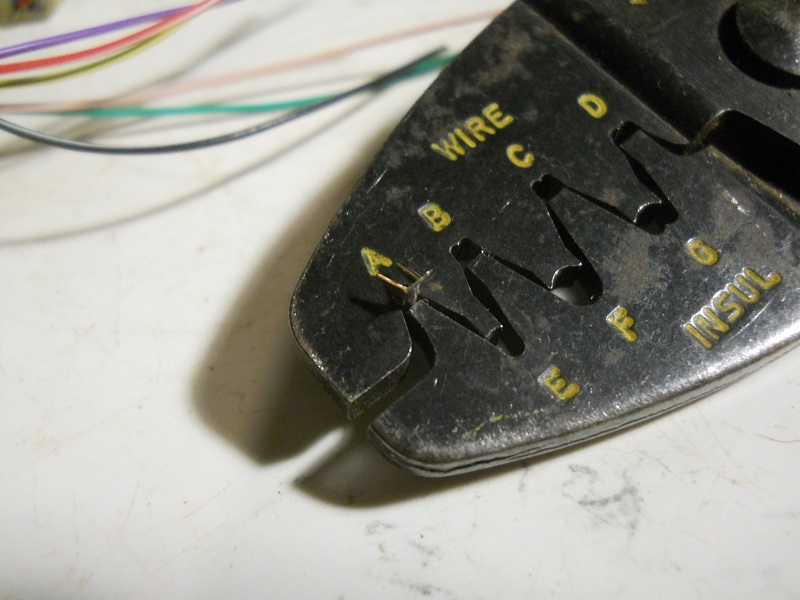 Yes, I know that you can crimp the terminals with something other than the specified crimper, I used to do it with just a small needle nosed plier. You just need to crimp the wire and the insulation separately. The problem is I shake enough already, I don't need to give myself MORE chances to screw something up. The correct tool crimps both the insulation and the wire in one action, eazie-peazie. Besides, I'm a tool junkie. There, I said it, but I ain't proud of it - at least not too much. Maybe I need to find my local TA (Tools Anonymous) and go to a meeting? You know, the kind of meeting where you stand up and say "Hi, I'm Don and I'm a tool junkie". Haven't had too much time to work on this lately. I got done killing evicting all the rats and cleaning up their nest, that's the 1st photo. My Mom's not doing too well, she's 94 and broke her right hip the day after Christmas, so I've had a few other higher priority things to work on. However I did get a little more work done on the soldering rig. I took a screen shot of the 3D PDF, that the second photo. If you want to view the 3D PDF I am attaching that too, that way you can manipulate the view to see any angle you want. The solder drive is currently a pair of 3D printer Bowden extruder drive gears. Although that may change to just one gear with the solder being pressed between the gear and a bearing. Ii doesn't show it in detail yet, but the iron will be advanced/retracted by a 3D printed rack and pinion set-up. I finally found a site that takes you through gear design in all the excruciating detail that you can stand. No progress to report, my Mom passed away on the 20th so my brothers and I have been a little busy for the last week or so. She had everything pretty well planned out and we knew what her wishes were, so most of the heavy lifting had already been done. It seemed like there was still an awful lot of leg work that needed to be done. We'll pretty much wrap things up tomorrow - so by Monday things will start to feel a little more "normal". I managed to lose my 3D CAD work for the "Y" and "Z" axis fine adjustment that I did over the weekend. However on a brighter note, the last time that I fired up DesignSpark I got a notice that the BETA version of 4.0 is available for download. There must have been a couple of upgrades that I didn't pay any attention to since I'm running version 2.1. I was reading through the release notes for ver. 4.0 and found out that one of the Core changes that was made was the generation of a recovery file. Guess what I downloaded, all 1.1+ gigabytes of it. I haven't extracted it yet since I haven't found out if version 2.1 and version 4.0 can exist at the same time. I'd like to check out ver. 4.0 without overwriting or uninstalling ver. 2.1. I'd REALLY rather not start burning the bridge behind me while I'm still on it, you know what I mean? You could try WMware vSphere Hypervisor (Christ, last time I used WMware was 5 years ago - one product - now it's galore), a free virtual computer running on your existing computer => whatever catastrophes you have there, will not influence the "real hardware / software"
That way you can run a test of the new version without actually installing it on the real computer and you will still have access to the real files - though you can't delete them (or as long as they are in protected mode). When last we talked, sort of, I had made the fine adjustment screws for all the axis - they even worked! At least they mostly worked. I did get the fine adjustment required, things just flopped around too much. I've been thinking on this for a while, I haven't done anything constructive yet, but I've been thinking on it. It's my own fault, I tried to get sneaky and make the rack do double duty. I was trying to use it as both the rack half of the rack and pinion, AND - I was trying to use it as the guide/support bar. It mostly worked as the rack, but not so much as the guide/support bar. I had to open up the tolerance between the parts so that I could get relatively easy movement. However when I do this I've also got enough tolerance that things have a tendency to flop around. I'm trying to build a "Fix for the shakes", not just add another layer to the shakes I've already got. It's time for a major re-design. Or maybe it's another major re-design - I've lost track. I'm not scrapping everything, this idea is too close to actually working for me to do that. I am however going to scrap the rack and pinion idea. I'm thinking 8mm rods. It's what most 3D printers run on, and as our cousins across the pond say - "they're cheap as chips". I've even got LM8UU linear bearings as spare parts for my printer that I can use while I get some more on order. My current thinking is to manually move the axis to a rough position, clamp it down and use the screw for fine adjustment. There's only one axis that will require movement with every crimp, to load the wire and then to remove the crimped wire/terminal. I might keep the rack and pinion for this action. But, it would have a fixed stop at the crimper end of the travel, and I would still keep the screw for fine adjustment. I can foresee a lot of 3D CAD work in my near future. Future updates WILL NOT take another 5 months, maybe Monday-ish?? Another weekend gone and nothing to SHOW for it. Mind you, I got a lot done, I just haven't got anything I can show you because some silly bugger left home this morning without those files in hand. I've got some printed parts, but no matter how close I hold the parts to the monitor, this stupid PC can't see them. I took the idea of using 8mm rails for 3D printers and ran with it. I mostly scrapped the original design, I think I was able to re-use 5 parts without modification, the fixed and movable wire clamp jaws, the pinion and its' adjusting knob, and the holding bracket for the terminal crimper. I started the re-design Friday night and finished it late Saturday afternoon. In the process I came up with a method for making this thing multi-task, I made the Z-axis/wire holder bolt on to the X-Y assembly. That way I can use the X-Y assembly with my soldering rig, which is what started this whole thread in the first place. (Kind of a circle of life thing?) The unit that I wound up with, has 300mm long X-axis rails giving me a useful X travel of about 150mm, 130mm Y-axis rails with a useful Y travel of about 70-80mm, and about 100mm Z-axis rails with a useful Z travel of about 50mm-ish. The base that this thing will be bolted to will be about 200mm x 400mm, that's about 8" x 16" for us non-metrificated red-necks. To para-phrase the bus driver from "High Spirits", - It's genius, pure genius - just you wait and see. I fired up the printer Saturday night, and it's been running pretty much non-stop since then printing batches of parts. The Y-axis and Z-axis parts are completely printed. I printed the X-axis bearing holder last night, that was about a 9 hour print. The X-axis rail holder and rail clamp will be done printing when I get home, either that or I'll have a HELLUVA mess to clean up when I get home. That just leaves the misc. X-axis parts to print, which should take another 2-3 hours, and then the printing should be complete. I ordered a pair of chromed 8mm hardened rails 600mm long with assorted bearings and brackets, they're supposed to arrive by Friday. Those 2 rails will give me enough 8mm rail stock for all the rails this thing will need with enough left over to use for the soldering iron holder. Tomorrow I WILL remember the 3D PDF file. And, I'll get a family shot of the parts that I've got printed. Last night I finished printing the parts required for this X-Y table thingamabob. At least I think this is all of them. The first attachment is the 3D PDF of what this monstrosity will look like. The second attachment is a screen-print of that PDF. The last attachment is a family photo of the printed parts to date. Until the rails get here about all I can do is finish installing the brass threaded inserts and get everything bolted together. The rails have shipped, and FedEx is claiming that they'll be delivered by Friday. Glad to hear that you are moving again and hope that you get more success this time around. Think of it this way - you are more less the trailblazer, so you will also encounter ALL the bumps on the road. I'm reasonably confident that this version will work as advertised. I'm using the same guide rails and linear bearings as used on a 3D printer. So I've got no concerns about getting smooth and stable movement out of any of the three axis. The biggest concern that I see now will be the 2 part clamp that supports the Z-axis rails. If that doesn't work the way I want it to, it will be a simple matter to print a new 1 piece part and just press the Z-axis rails into it. I may just do that anyway to avoid the issue. Slightly off topic, but does anybody know what the accepted plural of axis would be? Hi Don, good to see more progress. I am going to stick my neck out and guess one axis, three or five might still be axis, as in a five axis milling machine. I was going to say three axes, but when I write it, it looks more murderous of the language. I will be interested to see what others say. Sorting out some of those irregular forms is nearly as bad as dealing with the shakes, but at the risk of scorn from the English majors, I will say less essential to resolve. Well, Google is your friend. The plural of axis as far as math is concerned, and probably CNC, is axes - but it's pronounced ax-eez. Back to the subject at hand. Last night the more I thought about it, the less confident I became in the Z-axis clamp being able to handle its' mission. I think that tonight I will reprint the Z-axis rail holder/clamp as a one piece part with press in rails. I can even thicken up that area of the part to give the rails a little more support, it's currently only 6mm thick. I've found that with my printer when making parts with an interference fit, a tolerance of +0.0 to +0.2mm gives me a nice solid press in fit. I am becoming less than impressed with FedEx, at least FedEx "SMARTPOST". The tracking information for my shipment of a quantity of 2 rails, 4 bearings, and 4 brackets is like reading the instructions for a Chinese Fire Drill. This package was "shipped" on March 22nd, took a week to get from California to Kansas, sat in Olathe for a few days, and now it looks like the U.S. Postal Service has it? How is that a FedEx delivery? Oh, I just know caught that it's FEDEX SMARTPOST. I think the Pony Express could have delivered it by now. Well, when last I checked, this morning as of 5:14AM the package has arrived at my post office. It doesn't say it's out for delivery yet, so either the tracking hasn't been updated or I won't see the package until tomorrow. Meanwhile the new printer, that I ordered a week AFTER I ordered these rails, was waiting for me on my doorstep last night when I got home from work. Color me surprised, the 8mm rails DID show up yesterday. It'll be a few days before I get back to this project though, too busy playing with setting up the new printer. My 20mm cube isn't exactly cubic right now, and I'm also playing with feed rates and temperatures. Just for grins and giggles one of the first things I printed was a 20mm cube using the g-code optimized to my old machine and started playing with the feed-rate and temperature. I need to print at 230° C on my old machine for it to be happy, this one is happy printing at 205° C. I was able to crank the feed rate up to 200%. I wasn't happy with the surface detail, but from the reading I've done that might be more of a cooling issue than a speed issue. Until I figure out what I'm going to do about the cooling, I'll just run smaller parts at a slower speed to give things a chance to cool off a little more before the next layer is added.